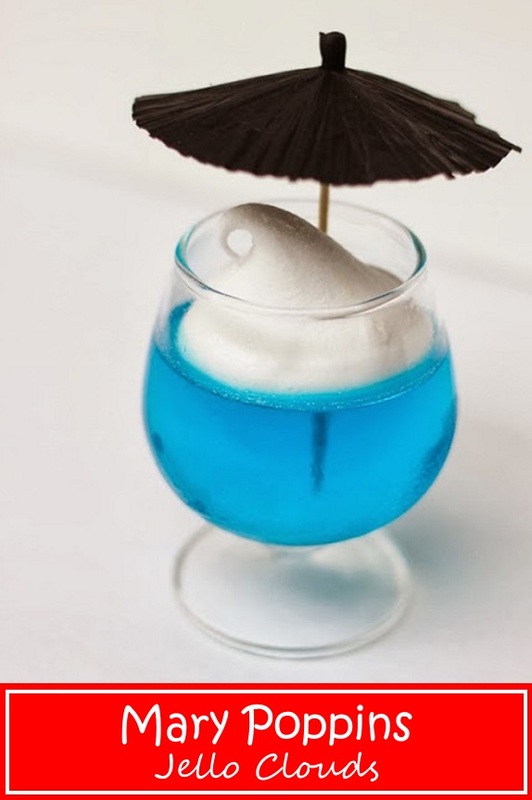 When I set out to make the Jello Clouds for the Mary Poppins Party, I could not figure out what to use for the cloud. I knew I wanted the end result to be something like this. At first, I thought I would try a 7-minute frosting, but I like to get all my food prep done ahead of time. I think that frosting is meant to be used immediately. The Pin that provided the inspiration sent me on a hunt for ready made marshmallow clouds. No luck! Not to be detoured, I set out to make my own. I didn’t take many pictures along the way, but I will give you the gist of how I did these. First, I lined my pans with parchment paper. I drew the outline of the top of my glass on the reverse side of the paper to know what size dollops I was aiming for. I sprayed the parchment paper with non-stick cooking spray. Then I made the marshmallow recipe at the bottom of this post. Working quickly, I put the marshmallow mix in a piping bag (or ziploc) and cut the tip end off. I squeezed the dollops by keeping the piping bag close to the base at first. Then, I released pressure and pulled up on the bag. As, the mixture starts to set, it is harder to control. This recipe made a ton of dollops, so I just used the best ones. Once the marshmallows set, I rolled them around in powdered sugar to store. Prior to placing them on the jello, I dusted off as much powdered sugar as possible. Line a cookie sheet with parchment paper and lightly spray the parchment paper with cooking spray. Lightly spray the inside of the piping bag with cooking spray. In the bowl of an electric mixer fitted with the whisk attachment, sprinkle gelatin over 1/2 cup cold water; let stand for 10 minutes. In a medium saucepan, combine sugar, corn syrup, and 1/4 cup water. Place saucepan over medium-high heat and bring to a boil; boil rapidly for 1 minute. Remove from heat, and, with the mixer on high, slowly pour the boiling syrup down the side of the mixer bowl into gelatin mixture. Add salt and continue mixing for 12 minutes. Add vanilla extract; mix until well combined. Spray a rubber spatula with cooking spray. Transfer gelatin mixture to the piping bag. Pipe dollops onto prepared parchment paper. Let stand for 2 hours. Place confectioners' sugar in a large bowl. Carefully remove marshmallows from pan. Add marshmallows to bowl and toss to coat. I am searching high and low for black cocktail umbrellas and cannot find them anywhere. Where did you get yours?